Saint John Fisher Parish falls within the boundaries of Holy Family Regional Catholic School, which makes it our parish school. Registered parishioners who seek a Catholic elementary education for their children are encouraged to enroll them at Holy Family. Saint John Fisher Parish supports active, registered parishioners with their commitment to Catholic education by providing an "in parish" tuition subsidy of $1,000 for the first child attending Holy Family, with an added subsidy for each subsequent child enrolled. To be eligible for the "in parish" tuition subsidy, families are expected to be active parishioners who attend Mass each Sunday and on Holy Days, lead a sacramental life according to the precepts of the Church, participate in the life of the parish, and financially support the parish on a regular basis. A minimum contribution of $15 a week is suggested. Families that choose to send their children to a private Catholic school or another parish school are not eligible for the "in parish" tuition subsidy. 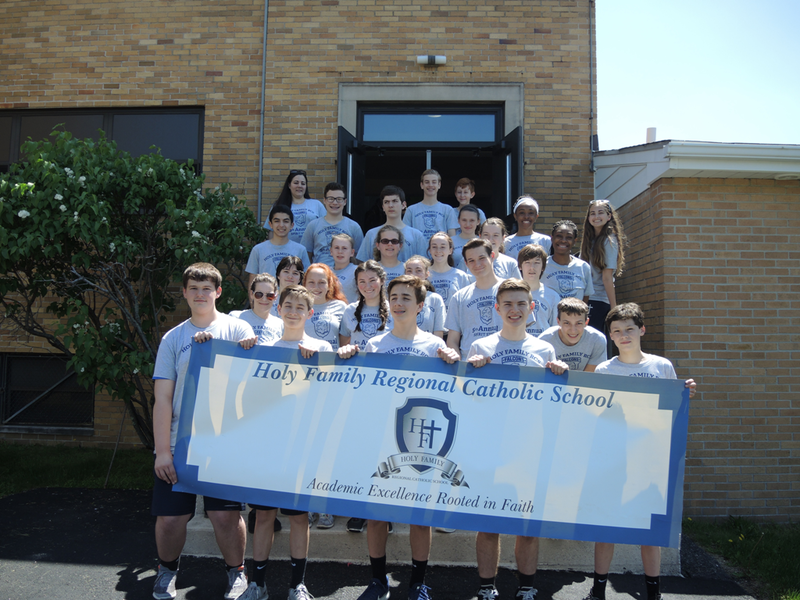 Holy Family Regional Catholic Grade School, other parochial schools, and private Catholic schools include Sacramental preparation as part of their curriculum. However, as a member of this parish, your child will receive his or her Sacraments at St. John Fisher Parish. There may be meetings and activities that parents and children will be expected to attend at St. John Fisher prior to the reception of the Sacraments. The teachers, staff and volunteers of Holy Family provide a quality education for our children. For more information about registration in the school, please contact Holy Family Regional Catholic School directly. 3265 Concord Road, in Aston, PA.
For more information, visit Holy Family’s web site at www.holyfamilyaston.org. For registered parishioners in need, financial aid is available through our Tuition Angel Program. Students attending Holy Family Regional Catholic Grade School as well as Saint John Fisher’s Parish Religious Education Program (PREP) are eliglble for the Tuition Angel Program. Financial aid awards are based on demonstrated need. Applicants must be active parishioners who attend Mass each Sunday and on Holy Days, contribute to the life of the parish, and lead a sacramental life according to the precepts of the Church. Click here for more information on the Tuition Angel Progam or to apply for financial aid.